Holyland, Universal Studios Orlando, Wet 'N Wild, Sea World, Discovery Cove, Walt Disney World, and Orange County Convention Center. The hotel staff was very nice. The rooms were clean and the beds extremely comfortable. I would definitely stay here again! 02-Jan-2019 Verified Review, stayed from Sat Dec 29 to Sun Dec 30 2018 at a $134.10 average nightly rate. The Quality Inn & Suites Universal Studios Orlando hotel near Universal Studios FloridaThe Quality Inn & Suites™ Universal Studios area is conveniently located just one-half mile from Universal Studios Florida, Universal's Islands of Adventure amusement park, and the Universal City Walk dining and entertainment district.This Orlando, FL hotel is within 12 miles of the Orlando International Airport (MCO) and the Walt Disney World theme parks. This hotel is less than five miles from Sea-world Orlando and Discovery Cove amusement parks, Wet 'n Wild Orlando water park and the Orange County Convention Center.For quick and easy transportation, an I-RIDE Trolley stop is right outside the hotel, providing easy access to International Drive, and many nearby attractions, excellent shops and a variety of restaurants.This lakeside Orlando, FL hotel offers many amenities, including a free hot continental breakfast, free local calls, free weekday USA Today newspaper, free coffee in the lobby and an outdoor pool.Business travelers will surely appreciate the access to copy and fax services.Each lovely guest room features every necessity, like a coffee maker, iron, ironing board, hair dryer and cable television. 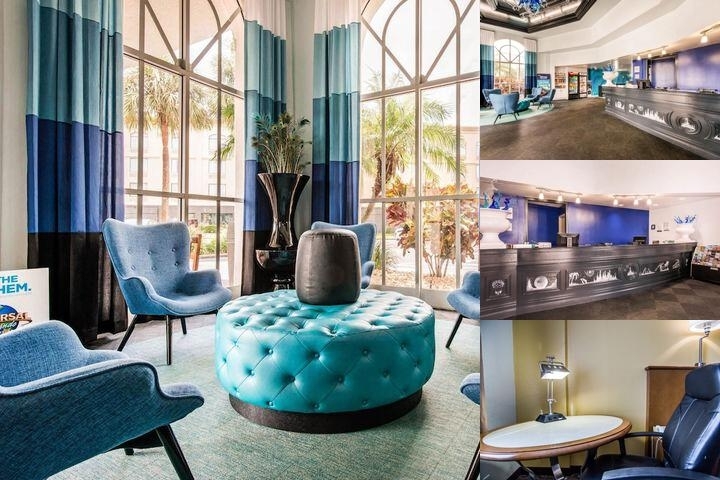 Handicap accessible and non-smoking rooms are available for reservation.Whether traveling for business or pleasure, the Quality Inn & Suites Universal Studios area is the perfect location when staying in the Orlando area. We can accommodate all your lodging needs. 10 miles from Orlando International Airport. No hotel shuttle available.